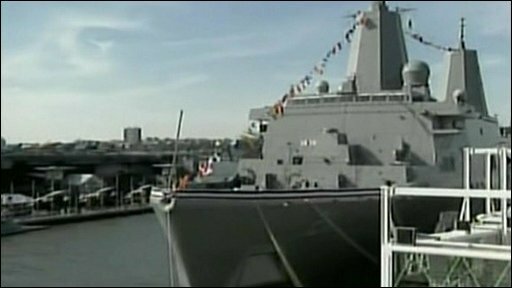 A warship built with steel salvaged from the World Trade Center has been put into service in New York. 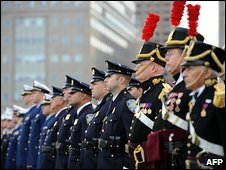 Hundreds of US Navy officers and sailors and also families of 9/11 victims attended the commissioning of the USS New York in Manhattan. "No matter how many times you attack us, we always come back," US Secretary of the Navy Ray Mabus said. The bow of the amphibious assault ship has 7.5 tonnes of melted steel from the debris of the World Trade Center. Secretary of State and former New York Senator Hillary Clinton, who spoke at the ceremony, described the ship as "a symbol of our unshakable resolve - this is a city built of steel". The ship's crest includes images of the Twin Towers and features the colours of the city departments that first responded to the terrorist attacks in which nearly 3,000 people died. About one in seven of the 361 sailors serving on the ship are from New York state, a higher percentage than would normally be the case, a Navy spokeswoman told the Associated Press news agency earlier this week. She said there had been many requests from Navy personnel to serve on the ship. Construction of the $1bn (£602m) ship was completed in Louisiana last month.